The Mediterranean Conference Centre at Valletta was built by the Knights as a major hospital, known as the ‘Sacra Infermeria’. It was considered to be one of the major buildings in the new capital city. Its construction began in 1574 according to plans by Gerolamo Cassar. At first the Sacra Infermeria included a courtyard and two main wards built at right angle to each other. 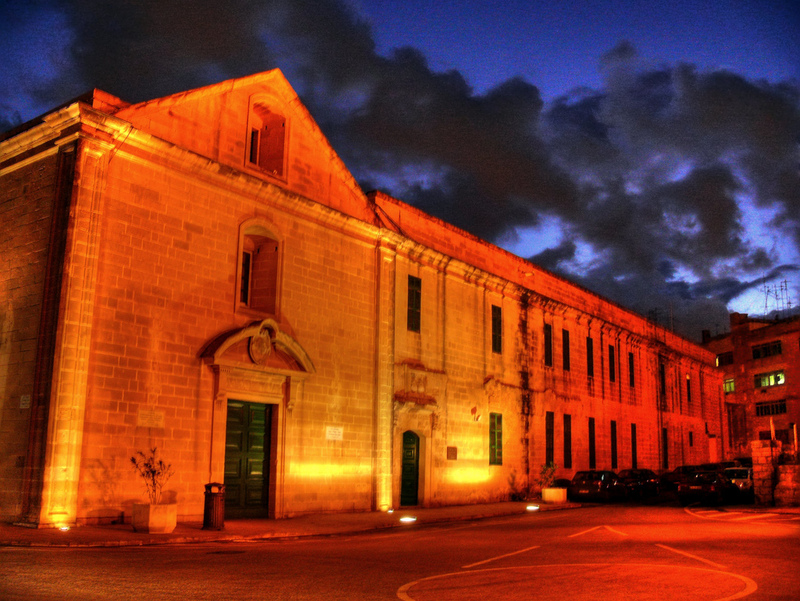 The Old Ward or Great Ward was built along the St Lazarus curtain overlooking the Grand Harbour. The smaller ward was known either as Saletta or Small Ward. The other rooms were used for patients with specialised cases or contagious diseases. These rooms were reached through a covered and balustrated passage. A decision was taken to enlarge the building. This occurred during the grand masterships of Rafael and Nicolas Cotoner. The large ward was extended and became known as ‘Sala Grande’. In the old ward, niches were created. Each niche provided facilities for two patients. These were used as latrines or as patients’ dressing rooms. Other additions were made to the building such as spaces for the new pharmacy and the residential quarters for the hospital staff. A series of internal staircases connected the two floors and the basements. The beds of the sick were placed inside the halls and it was also here where the knights used to serve the poor sick persons in silver items. The drugs were kept in majolica jars made in Caltagirone (Sicily). The walls were covered by woollen tapestries in winter and paintings by Mattia Preti in summer. The patients with acute cases were placed along the right side of the ward while those with chronic cases along the opposite wall. The ceiling was covered with timber supported by wooden corbels. Under the ‘Sala Grande’ there is an underground ward known as ‘Sala del Magazzeno Grande’ (Grand Magazine Ward known now as La Valette Hall) where galley slaves (buonavoglie) and sailors who needed hospitalisation were kept. Part of this area served as storage too. Its roof is cross vaulted with bosses of coats-of-arms of Grand Masters Jean L’Evesque de Cassiere and the Cotoner brothers. Below this ward there is another basement with plain ceiling supported by stone arches springing from the ground. During French and British rules this building served many needs. It served as a military hospital, Police Headquarters, for theatrical productions, a school, a general elections vote counting centre and an examination centre. It became known as Knightshall. It was badly damaged during the Second World War, AND remained in A dilapidated state for many years. Then it was decided to adapt this historic and architectural gem to the needs of a conference centre. Its halls have been cleverly adapted to offer an ideal venue as a modern conference centre. The Mediterranean Conference Centre is made up of nine halls. The La Valette Hall is used for banqueting. The main court yard was turned into a theatre (Republic Hall) with a seating capacity for 1,000. The Mediterranean Conference Centre also houses an audio-visual presentation – ‘The Malta Experience’ and a permanent exhibition of the Order of St John.